More than 50 UC Santa Cruz undergraduate students attended the annual conference for the Society for the Advancement of Chicanos and Native Americans in Science. For student Nicolas Blanc, attending a national conference aimed at advancing Chicanos and Native Americans in science where fellow students were encouraging each other to achieve their dreams was like a family reunion. Blanc was one of more than 50 UC Santa Cruz students who attended the national conference for the Society for the Advancement of Chicanos and Native Americans in Science (SACNAS). He was also one the five who received an award for presenting about research. 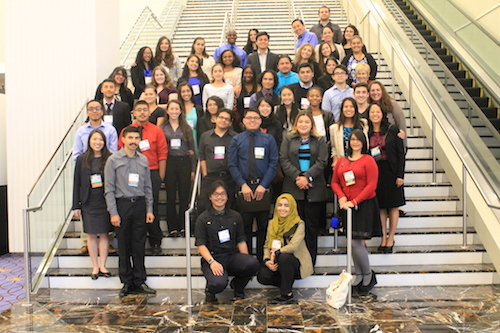 Additionally, the UCSC chapter was selected from more than 115 ones across the country to receive the 2015 Outstanding Chapter Improvement Role Model Award, which recognizes its library and resource website, independent study course, collaboration with other chapters, and engagement with community colleges. The conference, held in Washington, DC, in late October, gave students a chance to meet with professionals in their fields, showcase their work, and ask questions about graduate school and career development. Student Joanna Perez led the chapter last year. She is serving as co-president this year with Adriana Landeros. Santiago Sanchez, “Finding sites of pre-mRNA and snRNAbinding to splicing proteins Cus2, Hsh49, Hsh155, Prp5, and Prp9 during spliceosome assembly and splicing”. The UCSC SACNAS chapter is working to help encourage other students, specifically in middle school, who are less engaged and unsure about science. The chapter goes once a week to Branciforte Middle School to keep students engaged and interested in science. “The students went from at first literally saying, ‘I’m not doing this,’ about a project to, ‘I really want to know what black holes are.’ That’s what keeps us motivated,” said Landeros. Beyond middle school engagement, the chapter continues to work with community colleges to support transfer students like Ivette Perez, now in her third year. “It’s a very supportive community for the students; I think of Adriana as a mentor because she’s always pushing us to get better,” Perez said. The students who attended the conference used what they learned to hold a Paths after Graduation Workshop for all students to learn about graduate school, research opportunities, and the application process.